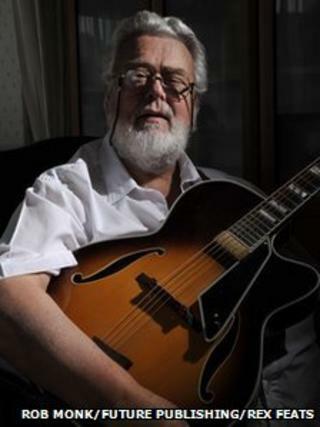 Prolific session guitarist Big Jim Sullivan, who played on hits by stars including Tom Jones, Shirley Bassey and Dusty Springfield, has died. Sullivan, 71, was reputed to have played on more than 1,000 hits including 55 number one singles. His credits included Petula Clark's Downtown, What's New Pussycat by Tom Jones, Shirley Bassey's Goldfinger and Release Me by Engelbert Humperdinck. His widow Norma said he died peacefully at home in West Sussex on Tuesday. Sullivan was one of the most sought-after session musicians of the 1960s and 70s. The list of Sullivan's recordings on his website features many of the era's biggest names, including Billy Fury, Adam Faith, Frankie Vaughan, Helen Shapiro, Freddie the Dreamers, Cilla Black, The Kinks, Marianne Faithfull and Sandy Shaw. His other notable singles included Frank Ifield's I Remember You, Make It Easy On Yourself by the Walker Brothers, Space Oddity by David Bowie, Ferry Cross the Mersey by Gerry and the Pacemakers and Sunshine Superman by Donovan. Born James Tomkins, he started playing the guitar aged 14 and turned professional within two years. He backed Eddie Cochran and Gene Vincent on the 1960 tour during which Cochran died, and would give guitar lessons to a young Ritchie Blackmore, who went on to form Deep Purple. Sullivan was a member of Tom Jones' touring band between 1969-74 and went on to become a part of the James Last Orchestra. He is also credited with playing a part in a number of key developments in rock, including pioneering the use of the fuzzbox and the talkbox.